We sell A. Vogel (Bioforce) products like A. Vogel Stress Relief Daytime® Valerian & hops (15ml tincture) - herbal remedy for mild anxiety online in the UK and directly from our award-winning store in Scotland. If you want to automatically receive an email when 'Stress Relief Daytime 15ml' is back in stock, just leave your email address below. Stress Relief Daytime® is a licensed traditional herbal remedy for the temporary relief of symptoms of stress and mild anxiety. 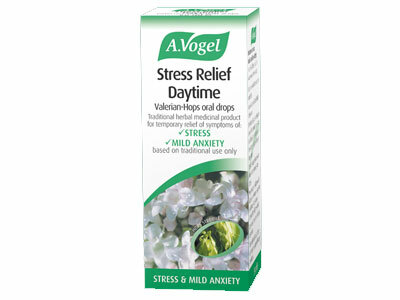 A. Vogel's Stress Relief Daytime is produced using extracts of freshly harvested, organically grown Valerian and Hops. The herbs are picked fresh and used within 24 hours of harvest. A traditional herbal medicinal product used for the temporary relief of symptoms of stress and mild anxiety, exclusively based upon long-standing use as a traditional remedy. We sell real A. Vogel (Bioforce) and other Sleep & Relaxation directly from our shop in Scotland and online throughout the UK. Where can you buy real Stress Relief Daytime 15ml safely online? If you are wondering where you can buy A. Vogel Stress Relief Daytime® Valerian & hops (15ml tincture) - herbal remedy for mild anxiety safely online in the UK, then shop with us. We are an actual health foods shop; with real people selling real foods and products. Our award-winning independent shop is located in Stirling, Scotland since 1976. You can buy our Sleep & Relaxation in store or safely place an order with us online or over the phone. Stress Relief Daytime 15ml - A. Vogel Stress Relief Daytime® Valerian & hops (15ml tincture) - herbal remedy for mild anxiety in Sleep & Relaxation and Herbal Remedies, Tinctures & Supplements.